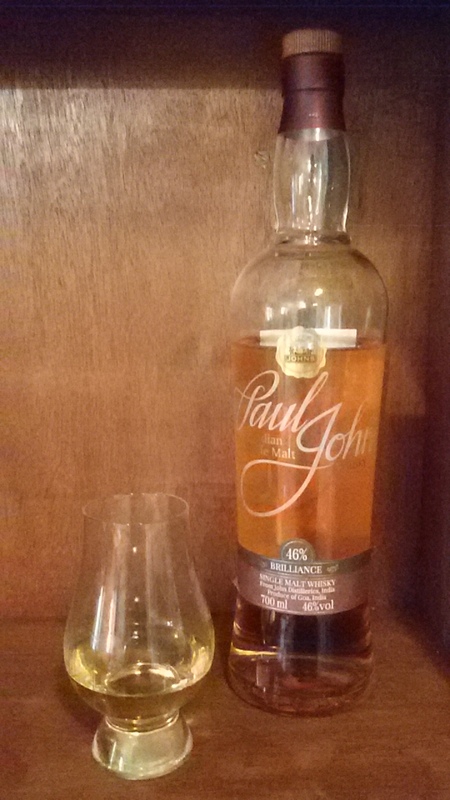 I was first introduced to a Paul John single malt in January 2015 with their mildly peated Edited. It was bought by one of our tasting club members on a trip to Goa. Our merry samplers were honestly surprised to discover it was a single malt from India and our overall impression was that it showed promise and made us curious for more. After my post on Edited, Michael John, master distiller for Paul John, reached out with a kind offer to send a few expressions for us to try. Naturally we were thrilled! It is rare to compare different expressions from the same distillery – then to have that be from India?! How could our desi hearts resist! Fortunately I already had a trip to Goa planned so had visions of throwing into my bag a couple of small bottles… the reality was a wooden crate filled with a Paul John Quartet sufficient to fuel more than one tasting session! As I was the common thread, did my best to keep ‘mum’ to not influence others experience… you will see some overlap but also a few different perspectives too in the tasting notes. Initial pour from newly opened bottle rewarded us with an immediate wash of jackfruit aromas which dissipated, strong ripe fruit, medicine capsule like b-complex, vanilla, faint nutmeg, overall quite sweet with a cognac-like quality. As it aired longer, had a sour curd element, tinge of leather beneath a lavender perfume. One even noted a punch of vinegar? Lots of contradictions in reactions here! It was interesting sampling with two very different groups. Our regular tasting team are old hands at even 61% cask strength whiskies, so the initial ‘punch’ didn’t deter us… however our palates are also spoilt by some pretty superior stuff so Brilliance didn’t quite make muster for all concerned. Whereas the informal evening was a mix of novices and more experienced whisky sippers… Some found Brilliance a bit harsh needing time to adjust to the alcohol. However these same folks found the much stronger cask strength Paul John cousins Classic and Peated soooooo smooth! So perhaps it was all part of calibrating the palate. Certainly for the price-point in India (Rs 2,100 / approx $30), it definitely scores way above the typical Indian blends in the same bracket. There is also a definite pride-point in enjoying a single malt from India – especially Goa which is a favourite destination. Just to close, here is Paul John description for Brilliance which we read out after our sampling. We didn’t call the bitter quality ‘cocoa’ however that is one way to interpret it. There is brilliance everywhere in Goa… colours, fragrances and tastes all exude myriad shades of sensual delights. 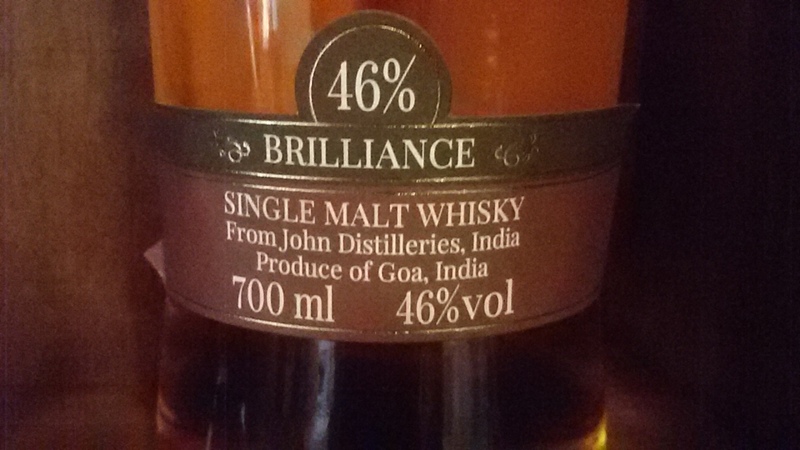 Brilliance is a non-chill-filtered non-peated Indian Single Malt Whisky that captures all this, sip after sip. It spoils you with the barley generating all kinds of juicy riches with the light Demerara sugars providing enjoyable companionship. Now sit back to the finish of a gorgeous cocoa, and spices that pamper your taste buds. It doesn’t gather any more brilliance than this. 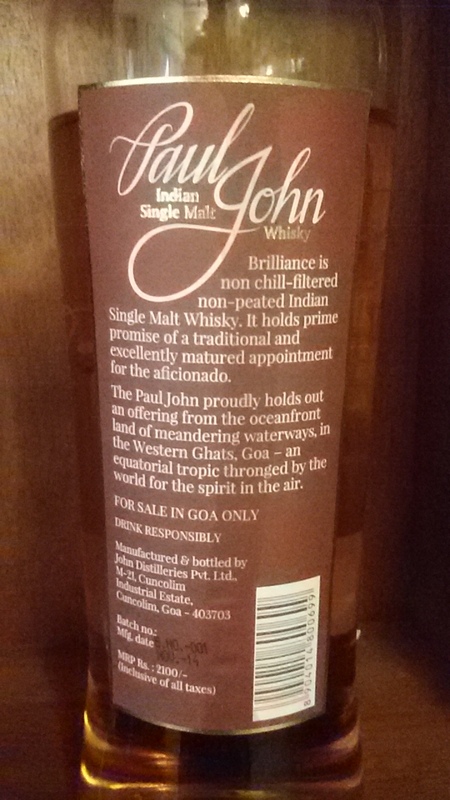 This entry was posted in Beyond Scotland, India and tagged John Distilleries, Paul John Brilliance, Paul John Brilliance Tasting Notes, Paul John Single Malt Brilliance, Paul John Single Malt Review, Paul John Whisky by Carissa Hickling. Bookmark the permalink. Seeing as we are currently lacking any reviews of our own for the Paul John drop we’re offering at our world whisky night, would it be ok to stick in a link to your own review on our digital menu? 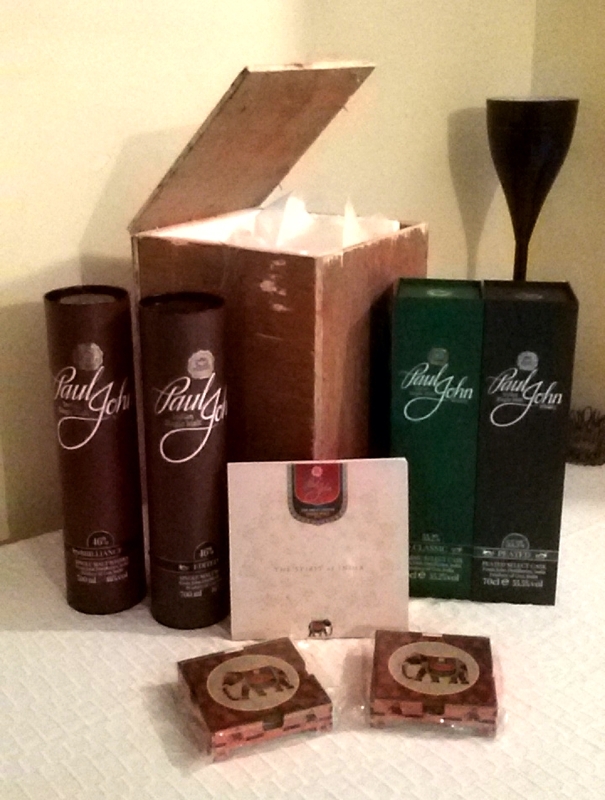 You are the authority on Indian whisky, after all! Please go ahead and provide a link… though ‘authority’ might be a stretch. 🙂 Enjoy your Paul John drop at your upcoming world whisky night and consider my raising a virtual toast to your collective merriment, mischief and whisky waffling! !